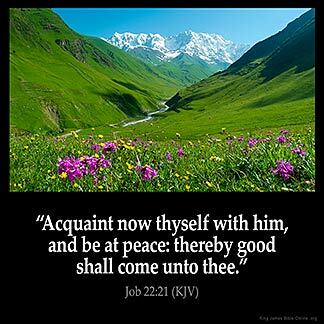 Job 22:21 — "Acquaint now thyself with him, and be at peace: thereby good shall come unto thee." 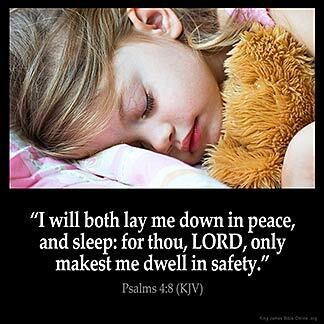 Psalms 4:8 — "I will both lay me down in peace, and sleep: for thou, LORD, only makest me dwell in safety." 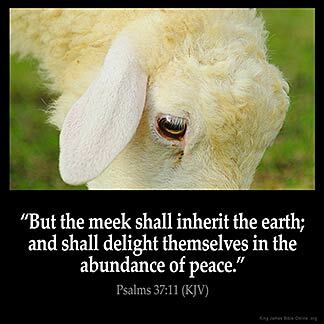 Psalms 37:11 — "But the meek shall inherit the earth; and shall delight themselves in the abundance of peace." 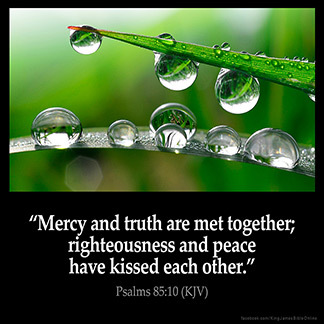 Psalms 85:10 — "Mercy and truth are met together; righteousness and peace have kissed each other." 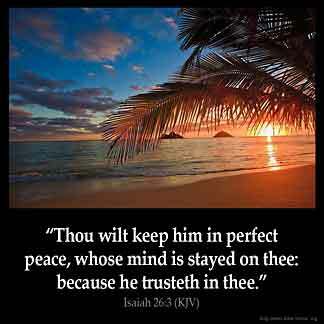 Isaiah 26:3 — "Thou wilt keep him in perfect peace, whose mind is stayed on thee: because he trusteth in thee." 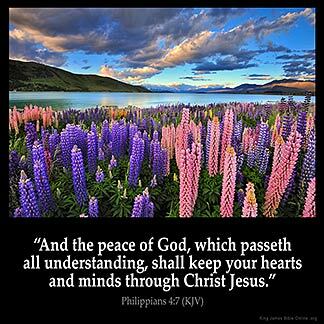 Philippians 4:7 — "And the peace of God, which passeth all understanding, shall keep your hearts and minds through Christ Jesus." 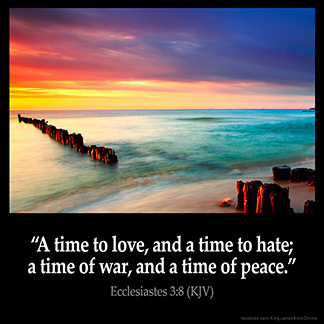 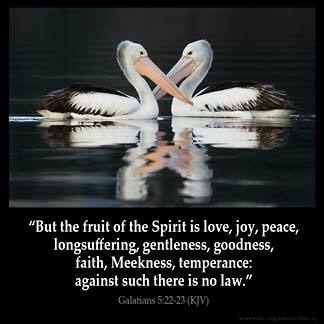 Galatians 5:22-23 — "But the fruit of the Spirit is love, joy, peace, longsuffering, gentleness, goodness, faith, Meekness, temperance: against such there is no law." 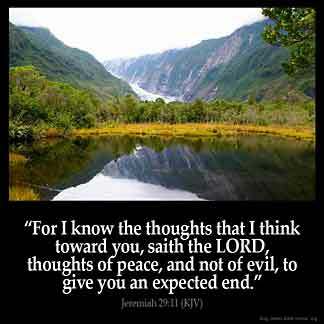 Jeremiah 29:11 — "For I know the thoughts that I think toward you, saith the LORD, thoughts of peace, and not of evil, to give you an expected end." 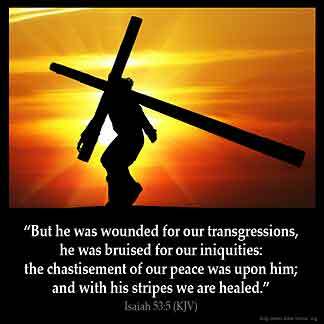 Isaiah 53:5 — "But he was wounded for our transgressions, he was bruised for our iniquities: the chastisement of our peace was upon him; and with his stripes we are healed." 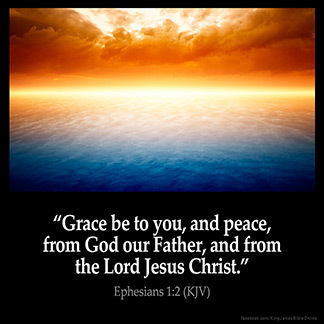 John 14:27 — "Peace I leave with you, my peace I give unto you: not as the world giveth, give I unto you. 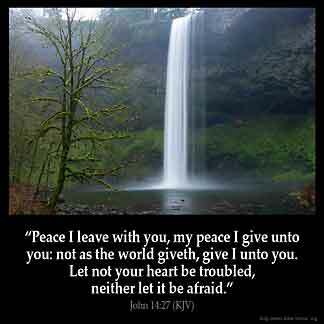 Let not your heart be troubled, neither let it be afraid." 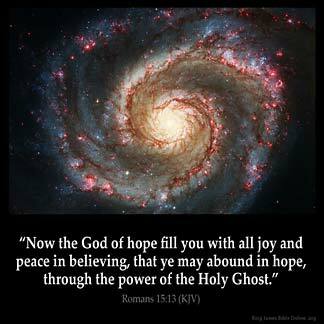 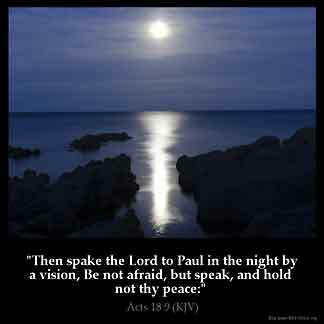 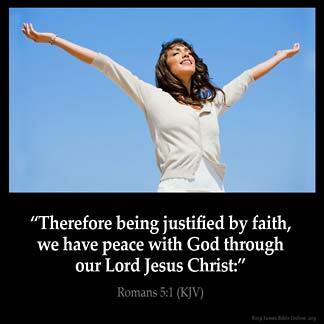 Acts 18:9 — "Then spake the Lord to Paul in the night by a vision, Be not afraid, but speak, and hold not thy peace:"
Romans 5:1 — "Therefore being justified by faith, we have peace with God through our Lord Jesus Christ:"
John 16:33 — "These things I have spoken unto you, that in me ye might have peace. 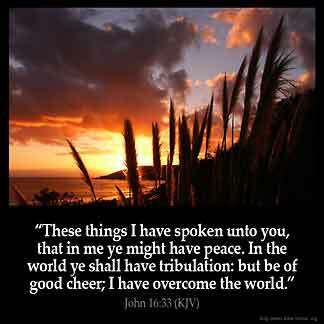 In the world ye shall have tribulation: but be of good cheer; I have overcome the world." 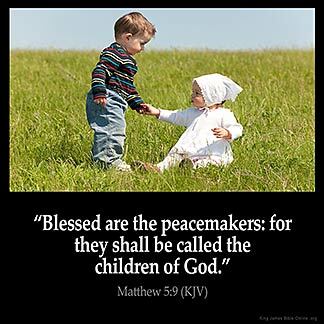 Matthew 5:9 — "Blessed are the peacemakers: for they shall be called the children of God." 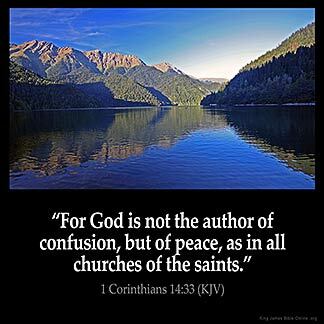 1 Corinthians 14:33 — "For God is not the author of confusion, but of peace, as in all churches of the saints." 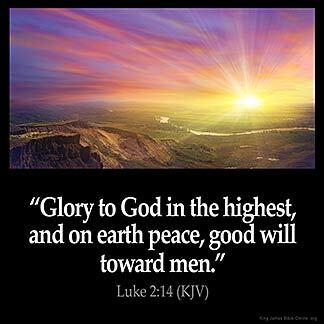 Luke 2:14 — "Glory to God in the highest, and on earth peace, good will toward men." 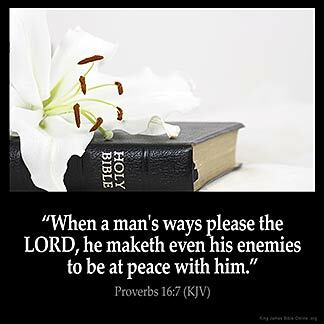 Proverbs 16:7 — "When a man's ways please the LORD, he maketh even his enemies to be at peace with him." 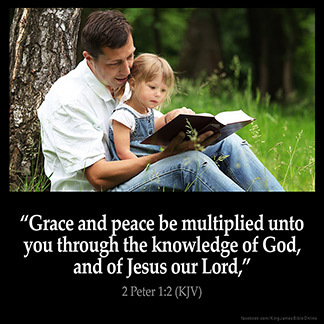 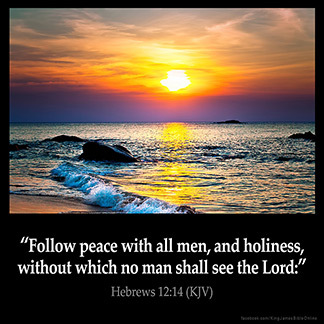 Hebrews 12:14 — "Follow peace with all men, and holiness, without which no man shall see the Lord:"
2 Peter 1:2 — "Grace and peace be multiplied unto you through the knowledge of God, and of Jesus our Lord,"
Ephesians 1:2 — "Grace be to you, and peace, from God our Father, and from the Lord Jesus Christ."